I haven't ever publicly shared the story of how Tiho and I first met, partly because I've yet to sit down and write it out and partly because I'm trying to preserve a fraction of sacredness over my private life within this "bare-it-all" media culture we're immersed in. That being said, this past Sunday (July 1st), we celebrated the first anniversary of our engagement and I feel compelled to share a bit of our beginning. Our earliest interactions occurred over email, and it was there that I first fell in love with the man who is now my husband, even before I had ever met him in the flesh. In our correspondance, I asked him about professional aspirations--what he did for a living, what he'd like to be doing for a living, etc.--and his answer blew me away. To this day, I cite it as the exact moment I knew he could very well be "it" for me. I've always known that I want my job to matter; that I want to enjoy what I do and feel challenged and inspired by my work. However, I've also always known that I don't want my job to be my life. That's not what work is to me. Work is important, and should certainly be fulfilling, but I have no desire to make it my life. I want my life to be my family--my wife and my children and what we will build together. I don't want my life's work to be defined by a job. I want my life's work to be defined by the people that I love. I love you, Tiho. I am so grateful that one year ago, in the country that stole my heart, you asked me to be your wife, and, in turn, your life. P.S. This is all slightly ironic to me, because T is exceptionally skilled at his "job" work. He is a web designer/programmer with a strong work ethic and deep commitment to professional growth and excellence. How sweet...I love what he said, it's exactly how I feel about work and love. Happy engagement anniversary! Aww what a beautiful response to your question! Happy anniversary - that card is a riot! Gloria, I laughed out loud when I saw it, mainly because that was totally us in France--eating everything in sight! Lovely, Kay. Happy Engagement Anniversary!!! That card is hilariously cute! T sounds like one great guy. 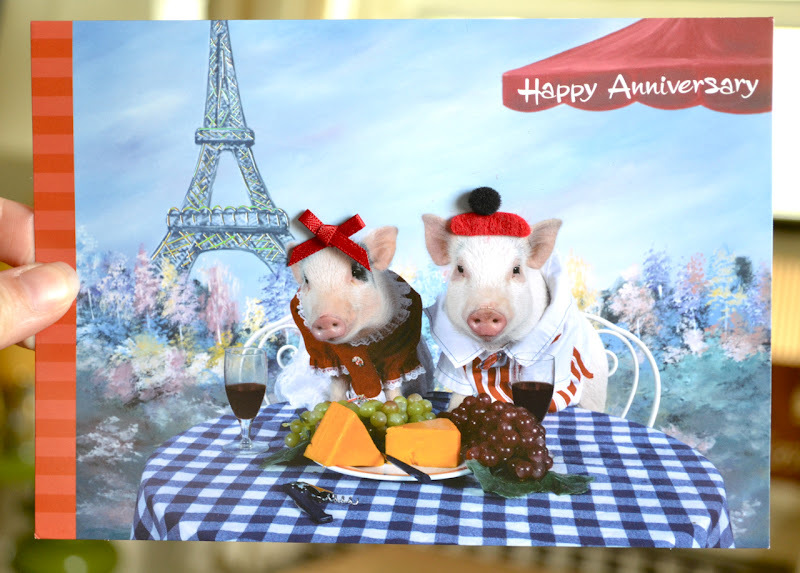 Oh Kayla–I had no idea our anniversaries were the same! That makes me so happy, and I hope the two of you had the most wonderful day together–we sure did luck out, huh? I love what he wrote and how you two got engaged and that fabulous card. Happy Anniversary to you two lovebirds. May you always be hog-wild for one another! Happy happy (belated) engagement anniversary!!! What an absolutely amazing card you found for the occasion. Totally perfect. So happy for you and Tiho and your extreme cuteness. Hooray!